Nutrition assistance is our nation’s first line of defense against hunger and a powerful tool to help keep families out of poverty. Come November, this critical federal assistance will be cut, making it that much more difficult for 1.8 million Pennsylvanians to put food on the table for themselves and their families. The November cut to the Supplemental Nutrition Assistance Program (SNAP), the program formerly known as food stamps, will impact all of the more than 47 million Americans, including 22 million children, who receive benefits. It will likely amount to a reduction of $29 a month in benefits for a family of three — $319 in all through September 2014. 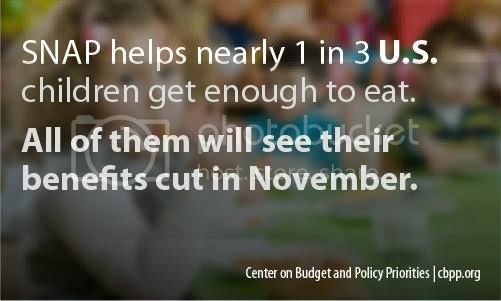 This is a serious loss for families whose benefits, after this cut, will average less than $1.40 per person per meal. To put the cut in some perspective, the Center on Budget and Policy Priorities estimates it will equal out to 21 lost meals per month for a family of four or 16 lost meals per month for a family of three. A majority of those who receive SNAP benefits are children and the elderly, for whom food assistance is essential. SNAP helps nearly one in three children in the U.S. get enough to eat. All 22 million of them will see their benefits cut in November. In addition to helping to feed hungry families, SNAP is one of the fastest, most effective ways to spur the economy. Every $1 increase in SNAP benefits generates about $1.70 in economic activity. Benefits boost demand for farm produce, helping to keep our nation’s farms strong. So why is it being cut? The cut is the result of an expiring provision in the American Recovery and Reinvestment Act (ARRA) that temporarily boosted SNAP benefits to strengthen the economy and ease hardship in the wake of the recession. This small increase has been a lifeline for many Pennsylvanians, a majority of whom work but earn low wages. It has allowed them to stay afloat during the worst economic crisis since the Great Depression. Even though the economy is still weak and families are still struggling, Congress has not acted to extend the modest increase in nutrition assistance beyond November. In fact, the U.S. House of Representatives could vote on cutting the program by $20 billion or more in the coming weeks. If enacted, such cuts could leave many families and their children without assistance to put food on the table when they need it most. That is the wrong path for the wellbeing of our nation, the health of our families, and the growth of our economy.